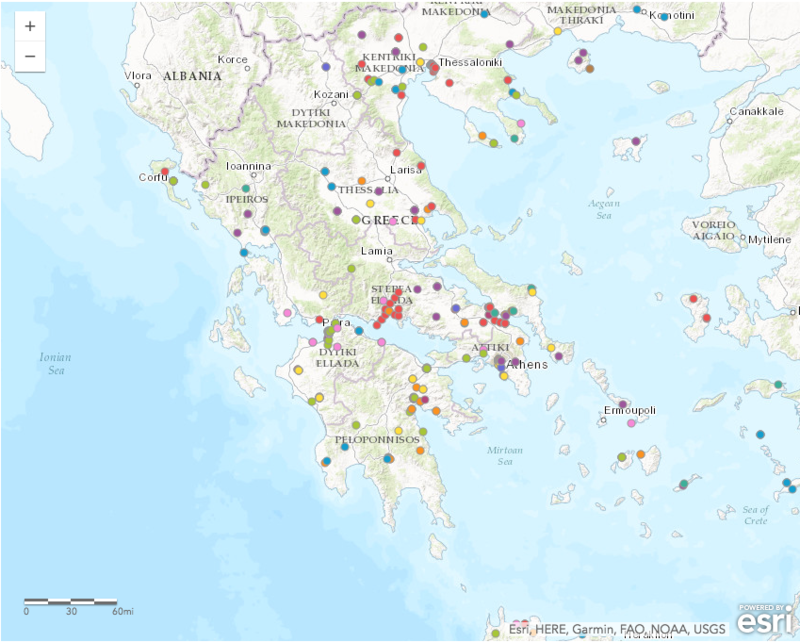 The Web Atlas of Ceramic Kilns in Ancient Greece is the first of its kind GIS database of kiln sites in Greece. Kiln sites cover almost five millennia, dating from the Prehistoric to Post-Byzantine periods (ca. 3000 BCE-1820 CE). We hope that the Web Atlas will help excavators of kiln sites to quickly contextualize them within their chronological, geographical, and typological horizons, as well as other scholars of Greek antiquity to address questions of ceramic production, distribution, and consumption in various eras and regions. To keep the Web Atlas updated we will welcome additions from our fellow archaeologists, as new sites come to light. The WebAtlas has recently received generous support from the College of Humanities Faculty Research Grant. To reference database searches, please use Hasaki, E. (ed). Web. Web Atlas of Ceramic Kilns in Ancient Greece (Date, Month, Year accessed). Click on the graphs below for interactive view. When you hover the mouse on the column the total number is shown. The charts are updated automatically with each new entry.